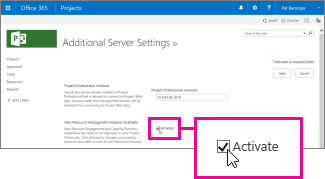 Resource engagements are only available if you're using Project Professional 2016 or Project Online Desktop Client, connected to Project Online or Project Server 2016. Project Standard 2016 does not include resource engagements. 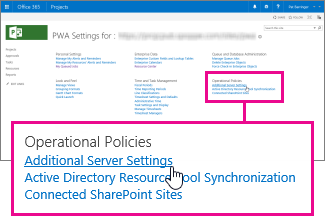 Sign into your Project Online site and choose Settings > PWA Settings. If you're in the Resource Center, you can click Additional Server Settings in the yellow note at the top of the view, and then skip to Step 3. Under Operational Policies, choose Additional Server Settings. Under New Resource Management Features Available, select the Activate check box, click OK after reading the message about data migration, and then click Save. What happens to my existing resource plans? If you've been using resource plans in your Project Online site, those plans will be converted into resource engagements. Learn more.